This shoot will suit either the expert or the novice as we offer a range of different flightings that range from the easy to hit to the seemingly impossible. 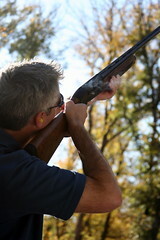 Whichever, we will be right beside you guiding, encourgaing and cheering when you start hitting the clays every shot. As you get better, the clays fly faster and lower to keep you tested. The location in the Trossachs is wonderful: this is Rob Roy country with small lochs, gently forested mountainsides and if you are lucky the distant call of the capercaillie. Your price includes 25 clays and if you get keen and there is space, we can continue beyond that for a modest cost. 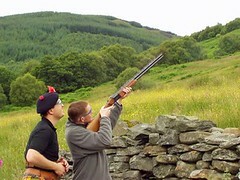 We provide guns and equipment, although you should bring good shoes and warm top.